Even though the premises of filmmaking and film reception in the pre- and post-cinematic ages are markedly different, there are significant correspondences and recursions. The cinema of attractions, writes Tom Gunning, never really disappeared but rather went “underground.” And already in 1986, quite some time before cinematic production became digital, Gunning saw evidence of a revival of the modes of early filmmaking in “what might be called the Spielberg-Lucas-Coppola cinema of effects” (Gunning 64, 70; see also Hansen “Early Cinema”; Manovich). In her reassessment of Gunning’s theories in 2006, Wanda Strauven refers to The Matrix as a “reloaded form of cinema of attractions” in its privileging of spectacular effects over narrative plausibility and psychological consistency (11; see also Bukatman). At around the same time, Henry Jenkins muses about the analogies between YouTube and the pre-cinematic vaudeville aesthetic, remarking on several correspondences, among them the “modular” and effect-oriented character of the performances depicted, their “push to conciseness” (“YouTube”; see also Rizzo; Dawson). Since then, references to the digital rebooting of cinematic modes of attractions have become too frequent to record. In what follows I, too, will be concerned with the reverberations of these two phases of filmmaking and film experience, but I will not focus primarily on the “attractions” of early and contemporary film. Rather, I am interested in the ways in which films both at the outset of the cinema’s formation and in its current late (or terminal) stage make use of (and redefine) narration—a feature of pre- and post-cinematic film aesthetics which, very much in keeping with Gunning’s reading of early film, tends to get short shrift particularly in readings that take a comparative approach to both eras. It is true that, in contrast to the classical Hollywood cinema, the films of the early and the late phase seem to be irretrievably caught up in the exploration of the technically and medially possible. But they do tell stories, too, and to assume that these stories do not matter is to ignore much of the appeal emanating from the films then and now (see Musser). I argue that the storytelling of the early and late cinema responds to a set of very similar epistemological conditions reigning in the early 1900s and 2000s. In both contexts, stories are told to compensate for anxieties of alienation especially prominent at the outset of the mass medial age and again at the moment of its digital dissolution. And it is the shortness of these stories that suit them particularly to the task of contingency management. Short narratives are faced with specific formal constraints. The limitations of the short form obviously take a toll on the complexity of narrative, at least when seen in contrast to the classical Hollywood cinema or the complex TV series. To approach the current predilection for the short, concise, clipped, and contracted in filmic narration by way of a detour into early film may thus also serve to highlight alternative modes of complexity—and eventually contribute to a reassessment of the concept of narrative from the vantage point of past and present practice. My attempt at tracing the post-cinematic moment around 2000 back to a corresponding constellation around 1900 relies upon the methodology of media archeology, approaching the history of film as a series of breaks, shifts, spillages, and eruptions rather than a smooth continuity. Reviewed in close conjunction with the aesthetics of the digital short, early film may thus produce, as Vivian Sobchack writes with respect to media archeological epistemologies, “a ‘presence effect’ that is capable of overturning the premises (and comprehension) of established media hierarchies and media histories” (324; see also Huhtamo and Parikka). Focusing on the short form of current and early filmic narration means to attend to the media regimes of both eras, but it also requires an engagement with larger cultural debates around efficiency, complexity, contraction, and concentration at the turn of the twentieth and the twenty-first centuries. In the first place, I am interested in the ways in which films try to compensate for their temporal and technical limitations, particularly by way of referencing larger narrative archives and latching on to other, earlier or parallel narratives and modes of storytelling. What Rita Felski writes about the significance of genre for “literary knowledge” can easily extend to describe the workings of a transmedial archive of storytelling: “knowledge and genre are inescapably intertwined, if only because all forms of knowing—whether poetic or political, exquisitely lyrical or numbingly matter-of-fact—rely on an array of formal resources, stylistic conventions, and conceptual schemata” (89). In the early days of film, the generation of narrative knowledge was accomplished to a large extent through the cross-medial referencing of literature. Literary texts were routinely raided by films in order to widen their narrative and social reach (Staiger; Musser). This indexing of an audience’s prior cultural knowledge and narrative memory is particularly appealing in view of the limitations of the short form: early films did not need to tell the whole story, they could assume their audiences to be familiar with the plot lines of Hamlet, Alice in Wonderland, Uncle Tom’s Cabin, and “Rip van Winkle,” to name just a few of the stories adapted to film at the time, and could thus both engage in storytelling and explore narrative modes (and narrative implications) that deviated from the techniques and readings established in literature (see Staiger). In the present era, the practice of medial cross-referencing has become so forceful and pervasive that it has been made out as a dominant cultural and technical logic: the logic of medial convergence (Jenkins Convergence). The short films of our time do not reference one committing key medium such as literature, but draw upon and tap into a whole range of media and media knowledge, disclosing a narrative web with a wide array of associative interfaces and docking sites. One obvious example of a contemporary strategy for achieving complexity and scope by way of reference would be the Marvel One-Shots, a number of direct-to-video short films produced by Marvel Studios to introduce alternative glimpses into the storyworlds developed in the Marvel Cinematic Universe—the series of films unfolding around the Marvel superheroes since 2008. The One-Shots present self-contained stories of 4 to 14 minutes in length, exploring aspects of the larger narratives that allow for ironic refractions or disclose nuanced revisions and may in turn serve as points of departure for other storylines. The short films are directly related to and inscribed in a larger narrative network but in contrast to the action- and effect-driven core narratives in their monumental appeal and claims (see Felix Brinker’s contribution in this book) they zoom in rather than reaching out in grandiose gestures. In doing so, they do not necessarily establish psychological depth, but they offer alternative reference points for affective engagement—either by way of generating comic relief when pursuing a minor character’s future fate (All Hail the King ) or by breaking with the feature films’ overpowering cause-and-effect routines by presenting disconnected events without larger narrative significance (A Funny Thing That Happened on the Way to Thor’s Hammer ). These shorts are self-contained in that they do not have any bearing on the story-logic and narrative unfolding of the films to which they signal. But obviously, they derive their significance from the larger context in which they were produced and in which they nest. They can serve both as access points to, and as rest stops within, the large and ramified terrain of serial narration. In a similar fashion, early films feed from nineteenth-century story knowledge (literary and oral), even though their relationship to this substrate is not one of simultaneity and correspondence (or convergence) but rather of supersession: they set out to reproduce and rework their material into something more contiguous to the sensibilities and needs of twentieth-century modernity. In both eras, the narrative reconfiguration performed by short films is inextricably conjoined with their exploration of medial possibilities and their efforts to chart and manage media environments that are growing exponentially at the respective moment in time. Both the early 1900s and the early 2000s witness a hyper-increase in the emergence and proliferation of new media technologies that need to be tested, appropriated, and culturally framed. The short form, suggesting a tentative and provisional mode of engagement, lends itself well to such projects of medial exploration and implementation. This also means that short films need to be seen as integral parts of a larger discursive concern with brevity. In particular, two topical terms seem to inform these discourses then and now: contingency and acceleration. Both have been made out as formative elements of modernist subjectivities and then again as constitutive factors of the digital age (Makropolous; Rosa Beschleunigung; Rosa Beschleunigung und Entfremdung), and I will bring them to bear on the short filmic form around 1900 and 2000. Both the experience of contingency and the experience of acceleration arise from the encounter with the technical innovations informing modernity and the digital age, but both also enter into feedback loops with these technologies—especially with the technologies of representation: “[T]he epistemology of contingency which took shape in the nineteenth century was crucial to the emergence and development of the cinema as a central representational form of the twentieth century,” writes Mary Ann Doane (19), who then goes on to locate the cinema in a much larger context of institutions and techniques aiming at the mastering or at least the charting of contingency—at what I will call contingency management—the workings of which she tracks to our time, “in the form of digital technologies” (20). The short form seems exemplarily suited to give shape and scope to the experiential frames of both eras, thus going beyond mere representation or superstructural depiction, entering “the very heart of social production, circulation, and distribution,” as Steven Shaviro writes about the workings of what he terms post-cinematic media (8-9). Shaviro makes reference to an aesthetic and epistemology of flow, which is indeed specific to the “computing-and-information-technology infrastructure of contemporary neoliberal finance” (8-9). But media’s proactive capacity, their propensity to act as “machines for generating affect” (8-9) is conspicuous already at the outset of the filmic project, as we shall see. Early film is as much about heightened affect as it is about spectacular effects—this too, it has in common with large parts of the post-cinematic scene of production sensibility. More than the feature films of the classical Hollywood period, pre- and post-cinematic films are concerned with what I will describe as an affective management of the forces of contingency and acceleration. They aim at capturing (in the sense of seizing and apprehending) the pervasive sense of transformation through technicization that characterizes modernity as well as the digital age and that impacts substantially on the respective conceptualizations of subjectivity and agency. And they work to turn the short form into a mode of the possible rather than a limitation. Hartmut Rosa attributes these effects to the era of “late modernity” that is not clearly dated but extends into the twenty-first century. While the condition may indeed be a phenomenon pertaining to the entirety of the modern experience, stretching from the 1880s to the present time, the modes of responding to this condition—whether in the guise of political or cultural theory, social management, or artistic and cultural processing—evolved unevenly and in fractured form over the course of the last century. As sociologist Michael Makropolous points out, the most substantial cultural accomplishment at the outset of that century may be a reconceptualization of contingency: contingency was increasingly seen in terms of an array of options rather than exclusively in terms of alienation and anomie. Even if they do not point the way to a deep-seated change, the “endless possibilities” disclosed by the condition of contingency can map out modalities of the future (rather than merely generating a sense of paralysis). This speculative and futuristic potential of modernity is actualized through narrative. The history of contingency formation and contingency management is complexly entangled in reflections on the conservation, transmission, and communication of information—and in this context modes and formats of narration play a pivotal role. One pressing concern of modernity that manifests in the very emergence of “print capitalism” in the eighteenth and nineteenth centuries (Anderson), but that becomes particularly urgent at the outset of the twentieth century, is the narrative production, storage, and mediation of scientific and cultural knowledge. The relevance of short forms in modernity hinges closely on the tendencies toward acceleration in knowledge formation, on the emergence of a global public sphere and global markets, and on the unfolding of new media technologies and channels of communication addressing mass and multiple audiences. Small narrative forms gain exemplary significance in this context. Martin Dillmann claims that modernity and modernism brought about an unprecedented valorization of the small form as a “modernist genre of contingency” in the face of a crisis of knowledge and certainty (Dillmann 165, my translation; see also Gruber). This valorization extends far beyond modernist literature, and it correlates the small and the short in ever more intricate ways. The modern media of communication and entertainment—the telegraph, the camera, the telephone, the radio—not only bring about a contraction of time and space, but also a contraction of form: more than ever before conciseness in form equals speed in transmission. Both the sense of urgency in an information society and the predominant regime of distraction enforced by the entertainment industry call for short, fast, condensed packages of information and data. In our century, finally, information, opinions, facts, and insights are increasingly launched by means of micro-narrative formats such as tweets, micro-blogs, status updates, text messages, or micromovies. Brevity serves to compress and polarize, zooming in, bracketing off, and sensationally heightening effects. In addition, short forms function as the modular elements of larger serial figurations: they can function as launching pads for collaborative efforts towards meaning-making and collective memory (as in wiki files or the workings of digital storytelling by means of authenticating sound bites or film clips), or serve as means of academic reorientation and storage (as in abstracts, synopses, or annotations), which in turn allow for or demand further processing. In all of these cases, short formats operate pointedly as modes of the possible and as formats of contingency management, while simultaneously contributing to the production of contingency and the enforcement of acceleration. When seen against the backdrop of contemporary discursive negotiations, the shortness of early film appears not only as a technical predicament that needs to be overcome; instead, it can be seen as an advantage, and certainly it presents itself as an integral part of the medium’s modernity (Hansen Babel 29). To illustrate the productive power of the short form, I will focus on the genre of the early fairy tale film (or féerie), as a popular and prolific mode of filmic meaning-making on both sides of the Atlantic (Zipes; Moen), before turning to the short filmic form in the digital age. The fairy tale film is particularly suited to my purpose because it demonstrates succinctly that technical attraction and narration, showing and telling, evolve side by side in the pre-Hollywood film, as two dynamics that both address the real in diverse but contiguous manners; it demonstrates, in other words, that “both the possibility of illusion and the ability of shock . . . are ambiguously predicated on the referential potential of the image,” as Shane Denson writes about the intricate enmeshment of divergent pulls of fascination and focus inscribed in the early cinematic experience (Postnaturalism 64). The filmic enactment of popular tales, just like filmic “adaptations” of literature in general, relies upon audiences’ cultural knowledge and their narrative and visual memory, capitalizing on seminal scenes (as constituted in print and by means of melodramatic stage renditions) and an iconic repertory of illustrations (Frazer; Staiger; Musser; Verstraten). But trick effects do not just superimpose a layer of spectacular “attractions” onto the stories; they affect what is being narrated, adjusting the “timeless” and “fantastic” material to the purposes of modernity and gearing it for future use. Compared to the Hollywood standard of narration, films like William K. Dickson’s Rip van Winkle (1896), George Méliès’s Barbe bleue (1901), Cecil Hepworth’s and Percy Stow’s Alice in Wonderland (1903), Edwin S. Porter’s Jack and the Beanstalk (1902), or Segundo de Chómon’s La belle au bois dormant (1908) seem crude in their narrative unfolding by means of scenic tableaux. In addition, they appear strangely unfocused in their attention management: the abundance of detail in each shot seems to impede sympathetic identification, narrative orientation, or suspense formation. Time and again, the short films compensate for their brevity by making the most of their screen space, arranging scenes simultaneously next to each other rather than unfolding them consecutively. Thus in Méliès’s take on Charles Perrault’s “La Barbe Bleue” (1697) (accessed through Jacques Offenbach’s popular operetta of 1866) we are confronted with a series of panoramas that unfold in complicated layers, separated by dissolves. 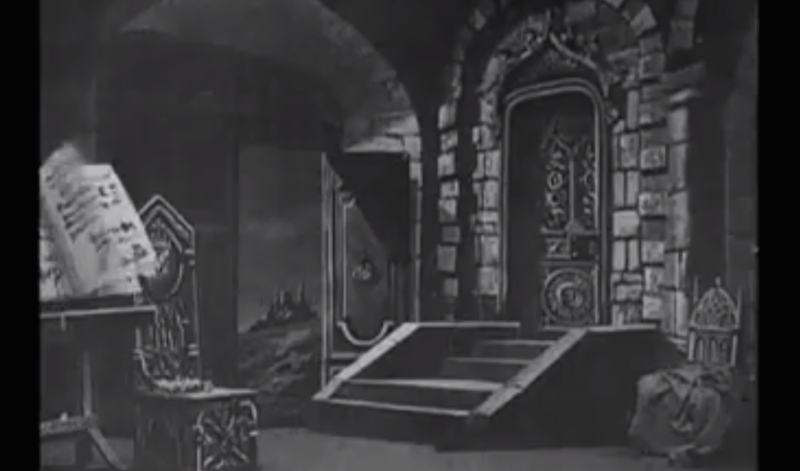 When the film traces Bluebeard’s presentation of his castle to his young wife, the couple is inserted into a densely packed fantasy space replete with complicated mechanisms of interaction and segmented by staircases, railings, and beams that partition the screen into several levels of action. The setting is stylized and markedly unrealistic in its theatricality. 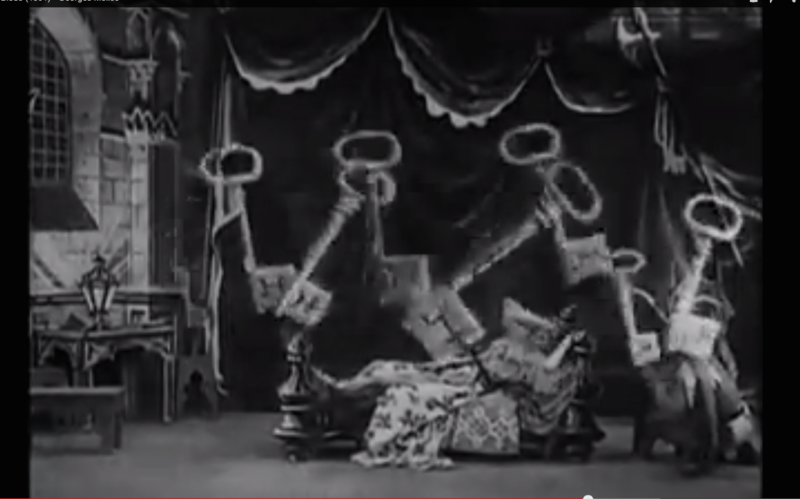 Figure 1 – Busy Screen: BARBE BLEUE (1901, Georges Méliès). Frame grab. The couple enters and leaves a scene of unceasing action, which breaks into slapstick chaos after the protagonists’ exit. At the climax of the story, before the woman enters the forbidden chamber, an impish figure jumps from the pages of a book on display in the castle, mocking and cheering her fateful decision. Figure 2 – The old medium: BARBE BLEUE (1901). Frame grab. He later re-appears, when she faces her dead predecessors, and now it is apparent that he is invisible to her. The imp also rejoices over what could be regarded as a materialization of the heroine’s nightmare: huge keys dancing over her head after her discovery that she cannot wipe the blood from the key she was not supposed to use. Yet, this visual decentering is not only about contingency, it is also about contingency management: the film systematically rehearses modalities of meaning-making, and it does so by negotiating the familiar and the new. Ironically, it is precisely the trick elements—the formal elements that are most closely associated with the self-reflexive aesthetics of a sensational cinema of attractions—which provide narrative guidance here. The imp that is jump-cut into the film, appearing in a cloud of smoke, propelled from the book that presumably contains the story that we are seeing unfold on the screen while at the same time pointing to an older media technology of narration, is invisible to the protagonist but hypervisible in his shock-appearance to the audience. This figure acts out exaggerated responses to and resonances of the diegetic action for the audience, creating a sense of suspense, urgency, and providing a focus to the narrative. It thus fulfils a task similar to the “lecturer” in the vaudeville theater or nickelodeon who routinely provided oral commentary to films in order to “highlight what viewers saw” (Gaudreault). The world of the fairy tale film is a fantasy space—at a remove from the modern scene as it is captured in the actualities of the early screen, yet by no means altogether disconnected. 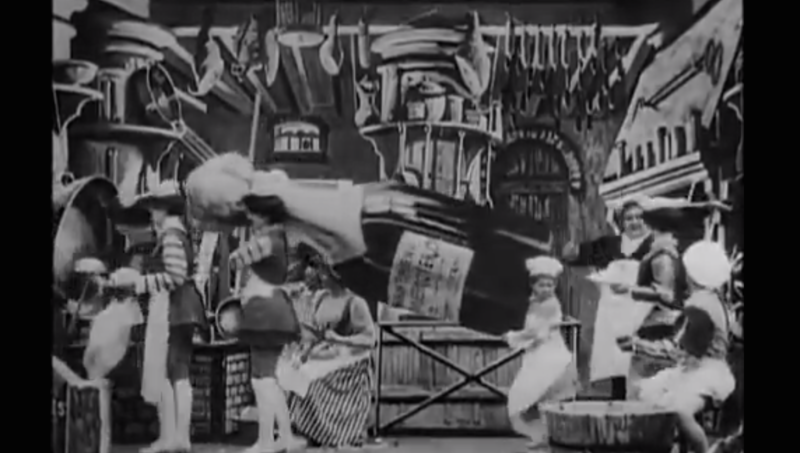 The film’s mise-en-scene presents an “intricate bricolage,” as Richard Abel has noted, “eclectically combin[ing] Renaissance and Second Empire architectural details, Belle Epoque fashions in women’s clothing, and, for publicity purposes, a giant bottle of Mercier champagne” (Abel 70). The conditions of modernity are playfully acknowledged and suspended as the familiar story is submerged in and retrieved from an array of side actions, inviting the viewer to review interactions and correspondences, line-ups and reciprocities: actions, accidents, and actants. The imp’s response to the heroine’s predicament may very well map an implied viewer’s response: the film does not engage in sympathetic identification with any of its characters but rather inveigles the audience to enjoy the thrill of fulfilled expectations and actualized fantasies. The authors of Eine Theorie der Medienumbrüche 1900/2000 (“A theory of media breaks 1900/2000”; Glaubitz, Groscurth et al.) see as one strong correspondence between the filmic imagination of early film and its digital replicant the “mediatization of subjectivities” that first comes to the fore in the alignment of discourses of psychology, physiology, electricity, and computing and that is synthesized on celluloid in the materialization and externalization (or “screening”) of mental activities: dreams, thoughts, visions, or ideas, often through trick effects. In an extension and refraction of this operative principle, 21st-century digital media fashion mediatized subjectivities into “medial actants” as they invoke and track man-machine-substitutions in what Denson calls the anthropotechnical interface (Postnaturalism). When in Méliès’s Barbe bleue or—to call to mind one of numerous further examples—in Edwin S. Porter’s Jack and the Beanstalk the protagonists’ fears or dreams are “screened,” the audience gets to see what the actor (or actant) diegetically cannot face—her or his unconscious. But what in the classical phase will be used to bring about intense moments of subjective psychological identification (as in, for instance, the visualization of the unconscious performed by Alfred Hitchcock with the help of Salvador Dalí in Spellbound ) serves in the early phase as a mode of disengagement and as a means of displaying and narratively managing contingency (foreshadowing similar functionalizations in our days, as we shall see). To call such scenes “subjective inserts,” as Elizabeth Ezra does (39), is thus problematical, since they might represent subjectivities, but they operate by means of a marked objectification. When the eight huge keys (or the seven white corpses and one fairy) are superimposed on the shot of Bluebird’s wife tossing and turning in her bed, this is not pulling us into her consciousness but rather turning her consciousness into a stage—or better: screen. Indeed, the mind becomes a screen here, displaying what cannot be seen otherwise. Figure 3 – The mind becomes a screen. BARBE BLEUE (1901). Frame grab. Our viewing position is modeled by the imp that rejoices at the spectacle of representing the unrepresentable. Time and again, early film’s trick cinematography uses tableaux or scenic arrangement almost paradoxically to capture the fleeting, the ephemeral, the chaotic, the contingent, and to stall the rush of acceleration. In that manner, the representation of the timeless and fantastic is employed to generate a panorama of options that can be watched, weighed, and enjoyed from a distance. In the course of this operation, the shortness of the filmic form is both accentuated and suspended, as the film operates for one by means of selection of but a few scenes from the original story, but on the other hand enlarges the chosen scenes and scenarios into intricate tableaux of almost painterly quality, accentuating the aspects of framing, composition, and lighting. The film’s suspense-driven narrative momentum is thus time and again arrested to present panoramic compositions that prompt to be explored and surveyed, projecting possibilities and options for re-readings of the familiar and narrative reorientation in the pervasive field of cultural knowledge. “[T]he technical capacity of audiovisual media to generate somatic-sensory experiences of extreme physical presence and bodily proximity (now called ‘special effects’ rather than ‘realism’) raises formidable challenges to both ‘narrative’ and ‘representation,’” writes Thomas Elsaesser (“Freud” 102); and indeed when “narrative” and “representation” are defined along the lines of the nineteenth-century novel or the feature film of the classical Hollywood phase, the challenges may seem insurmountable. But there is more to narrative than psychological realism, and there is certainly more to narration than subjectivizing point of view and focalization (see Elsaesser “Tales”). Once we pare down the concept to its most basic principles—instituting one or more layers of mediation between a representing agency and the represented, and interlinking isolated “incidents, actions, episodes” into some sort of “plot” (Brooks 5)—it may very well serve as a means of understanding how films engage with audiences, before and after the classical era. Obviously, one of the characteristics of the post-cinematic media regime consists in the field’s sprawl—the heterogeneity and multiplicity of what “film” means today. To engage with the short form could mean to look at professionally produced YouTube clips or Vimeo family videos, independent short films circulating among international festivals, television outtakes, clips, or teasers, webisodes and micromovies, and many other formats characterized by what Max Dawson identifies as the “aesthetic of efficiency”: “streamlined exposition, discontinuous montage and ellipsis, and decontextualized narrative or visual spectacle” (206). I will start my analysis with examples stemming from a segment of this market of brevity known as “micromovies”: films geared toward consumption on mobile phones and other small screens—and I will further narrow the scope by focusing on mobile phone-produced films. In doing so, I will not only be concerned with shortness, but with a whole range of further markers of “the small”: tiny screens, basic cinematography, limited technical possibilities, modest production costs, and a low threshold of access and distribution. As Caridad Botella Lorenzo points out, these films are “mobile” not only with regard to their production context but also in view of their consumption, which certainly does not require the setting of a movie theater, although micromovies have become regular contestants at film festivals and are thus also featured in cinematic venues. My final example will extrapolate from these findings to a “viral” short film circulating in social networks in 2014. Although part of a professional campaign and not a true micromovie, the video was produced on a small budget aiming for maximum impact in the realm of social media, and thus is also geared toward small screen reception, taking into account a wide variety of viewing practices and a quick turnaround in cycles of watching and sharing. Micromovies are deeply informed by media history, as Erkki Huhtamo argues by pointing out the analogies between one-shot films with minimal editing and the media technology of the flipbook. Obviously, these low-key productions signal back to the beginning of the cinematic era, but many of them also explicitly engage with even older institutions and formats of representation and narration: reactivating the aesthetic of the vaudeville act, and even older conventions of composition and staging—the theatrical tableaux, the museum diorama, the panoramic photograph, or the painted portrait and still life. The mobile phone-made stop-motion film Dot, produced by Aardman Animations in 2011 for Nokia, directly references a technique and aesthetic of filmmaking first popularized by early films. 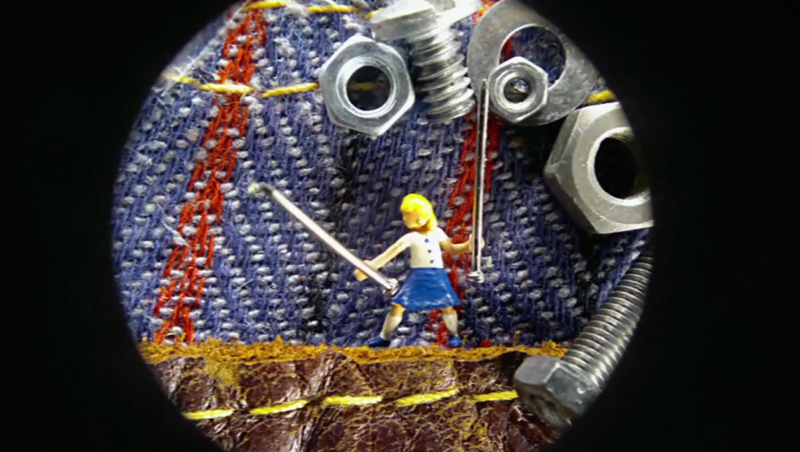 The 97-second film, shot by means of a portable microscope attached to the phone’s camera, entered the Guinness Book of World Records as “the world’s smallest stop motion character animation” (Ewalt 2010); the “making of” video accompanying its release drew at least as much attention as the film itself. The story is simple and fairy-tale inspired: A 9 mm-sized protagonist in the guise of a tiny plastic doll braves the dangers of an unraveling world and objects such as coins, needles, and safety pins coming alive. She is finally rescued by a bee, a flower, and a pair of tiny knitting needles. The micromovie’s fascination plays out entirely on the level of size and effects, its microscopic perspective epitomizes the materiality of the world it depicts, the palpability of fabric and fiber, the texture and composition of surfaces. Figure 4 – Putting it right: DOT (2011). Frame grab. The film’s narrative is charmingly simple and old-fashioned, while it employs a panorama of collisions and clashes, maneuvers and interventions, chain reactions and material transformations that unfold exclusively on the level of attraction, inviting its audience to focus on the technical rather than narrative level of presentation. This film is obviously not about identification, suspense, or sympathetic alignment, but exhibits an obsessive attention to the transformative powers of the object world that becomes the film’s most important actant, rendering the central character—if this is what we want to call the tiny doll—an integral part of its environment. The world on display is literally unraveling, only to be knitted back together into a colorful blanket at the end of the film. As in early cinema, distance (both visual and emotional) makes for contingency management. The film’s real narrative is located at a remove from its plot—it is a narrative of the powers of technology in the modern world. The advertising campaign that featured the film was titled “It’s not Technology, it’s what you do with it,” thus pointing to the possibilities of continuous reinscription, rereading, reconceptualization, and recycling in contemporary media ecology. No press release or article on the film fails to mention that the microscope attached to the camera was developed by a Berkeley professor of bioengineering in order to help “diagnose fatal diseases in remote areas of third world countries” (stopmotionpro.com) and that thus the original purpose of the technology at hand was to improve health care conditions in the developing world. The micromovie’s narrative playfully reiterates the reassuring message that the world can be put right one step at a time, moving from the microscopic to the monumental by using buttons, needles, coins, and mobile phone cameras. The same aura of material feasibility or craftsmanship infuses another mobile phone-produced film that is otherwise situated at the extreme other end of the micromovie universe: La perle by Marguerite Lantz (2007). This art film does not draw attention to its technical ingenuity but exhibits a theatrical—or perhaps more appropriately: pictorial—simplicity of mise-on-scene and cinematography. La perle depicts a young girl’s gradual transformation into Jan Vermeer’s The Girl with a Pearl Earring (1665). The micromovie seems pointedly non-narrative, consisting of a long shot of about four minutes, showing its protagonist in the process of putting on make-up and costume modeled on the portrait. Yet “the poetics of still lives is not necessarily opposed to storytelling,” as Rita Felski points out (102). In La perle, it is precisely through the filmic mode that narrative enters the enactment. After all, the film’s portrait is far from “still.” The girl uses the mobile phone as a camera and as a mirror, checking the progress of her performance on its screen as she goes along. Since the actor focuses on the screen and not the camera, however, she never glances directly at the viewer, except at the very end of her transformation, for a few brief and flickering moments. 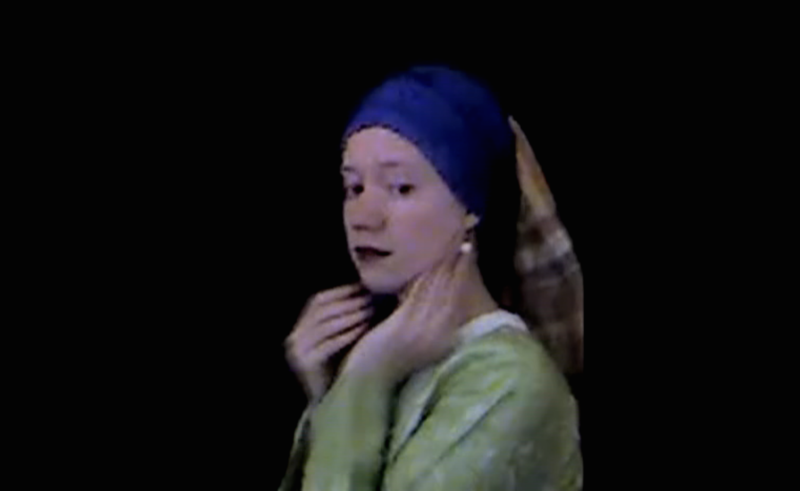 The pixelated graininess of the image emulates Vermeer’s textured brushstroke; color, tonality, and style of the film and the famous painting are similar and, of course, strikingly different at the same time (Roger Odin, qtd. in Lorenzo). The performance is shot against a dark background, the camera immobile throughout, but we do get an idea of a larger, invisible space of action: the background sounds indicate a public space—it could be the clangorous hall of a museum or gallery. At one point, a cell phone can be heard ringing. And while the girl’s transformation is finally accomplished, it is never complete: the girl keeps moving, fiddling with her garment, checking her appearance, restlessly moving her eyes and blinking, until she finally gets up and leaves the frame of the shot before the painting has had a chance to fully materialize. Like early narrative films, this micromovie taps into a larger archive of cultural knowledge, although at first glance the relation seems less mediated in La perle: where a film like Barbe bleue signals to a larger narrative by indexing iconic scenes, picking up bits and pieces of the familiar material and improvising on it, as it were, the referencing of La perle seems more faithful and all-comprising, actually replicating the painting on screen. But then, the screened image never goes still (neither with respect to movement nor to sound), and the effect of simulation is alternately generated and undermined. Moreover, to filmically reenact The Girl with the Pearl Earring in 2007 is also to call up the popular memory of the 1999 New York Times bestseller of the same title by Tracy Chevalier and its 2003 film adaptation starring Colin Firth and Scarlett Johansson. Novel and feature film provide a background story to the painting, rich in romance and period detail, while the micromovie both acknowledges and defers these narrative associations by enacting (almost) nothing but the image, and still inserting it pointedly into a discordant medial frame conveyed by the aural and visual superimpositions and layering. Developing the image over the course of several minutes, the film stretches time, but simultaneously contracts and condenses it by forcing the artistic masterpiece onto the small mobile screen and by systematically eliding the epic love story told around the painting, while calling it up through its very mediality of adaptation. 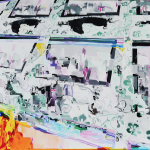 Working with a rich cultural repertoire of multiply mediated image and story knowledge, which is evoked and disturbed by way of montage, framing, perspective, processing, and sound, the short film generates what Denson calls “metabolic images” (“Crazy Cameras”) (rather than one “image” as the reference to the painting might suggest), producing an effect of an almost imperceptible decentering of subject position, mixing the hyperrealistic with the oddly unnatural, and eventually defamiliarizing the classical painting but also the very medium of film, which seems odd in this particular mode of operation: at the same time in the thrall of things and markedly removed. Figure 5 – Almost the same but not quite: LA PERLE (Marguerite Lantz, 2007). Frame grab. La perle’s static one-shot structure, its borrowings from older representational frames such as the theater stage and the painting, and its indirect gesturing to pre-cinematic conventions of “showing and telling” call to mind the aesthetic of early film, while it refrains from a direct acknowledgment of this analogy as in the Aardman animation. In closing, I would like to turn to one last example of a digital short—drawing on the operational mode of social campaigning this time. Like the Aardman animation, this film is geared toward momentarily arresting the flow of social media perusal, although in fact it feeds into this flow by means of its extremely segmented and short format of narration. 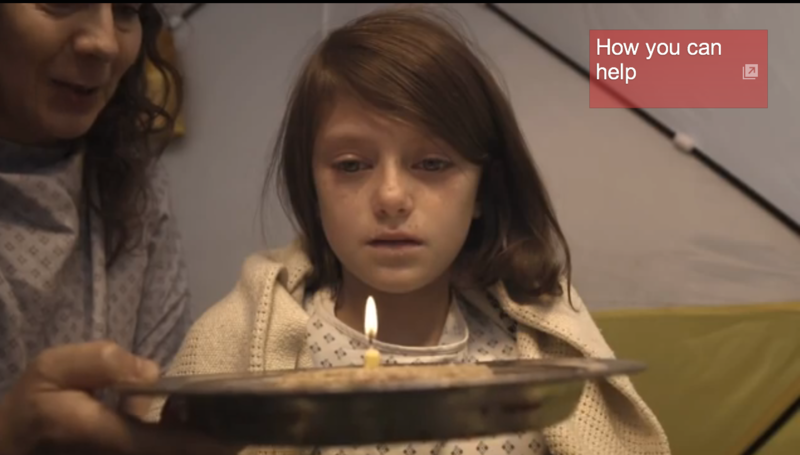 The film was shot as a campaign video for the charity Save the Children, responding to the humanitarian catastrophe of the Syrian Civil War in early 2014. Save the Children enlisted the London agency Don’t Panic to produce a 90-second film which was launched in March 2014, and received 21 million views on YouTube within five days. The short does share some functions with the classical TV commercial, but formally and technically it is clearly modeled on a YouTube aesthetic of the digital age, adopting the popular format of the “one-second-a-day” video to depict the life of a girl in London over the course of a year, from a glimpse at a birthday party in the safe circle of her family to the final shot of her next birthday in a refugee camp. Figure 6 – One second a day: Save the Children Campaign Video, 2014. Frame grab. 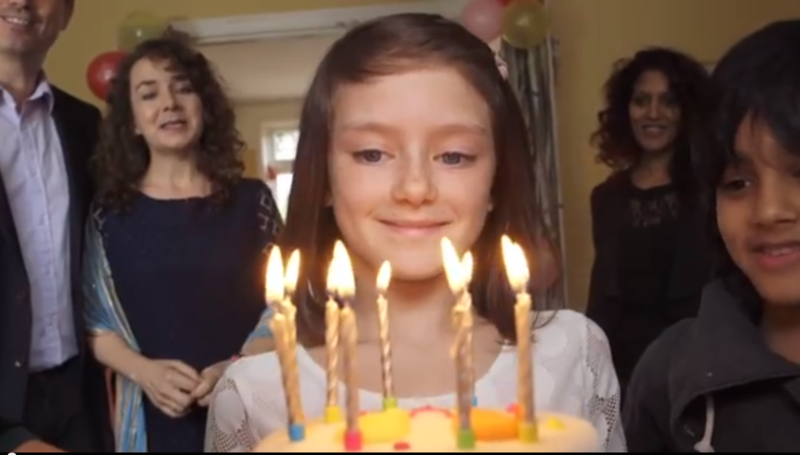 Figure 7 – One second a day: Save the Children Campaign Video, 2014. Frame grab. Obviously, the film’s effectiveness consists in the way in which it pulls the distant action in Syria into the lives of its target audiences in Europe or the United States. Its narrative relies upon the omnipresence of the formats of the family video on the one hand and the war documentary on the other, filmic modes of representing everyday occurrences which are so familiar that they seem medially transparent, at least as long as they are not edited into second-long disjointed bits and pieces. In many respects the film returns to the early aesthetic of the tableaux in filmic narration, but it contracts the panoramic shots in a manner that replaces the aura of the painting or stage with the appeal of the snapshot. On its plot level, the film depicts order deteriorating into chaos, dramatizing the process by means of fast cuts and marked breaks. On the level of narrative logic, aesthetic, and affective appeal, however, the film engages no less in contingency management than all the other examples considered here: it creates coherence and linearity, allows for a pointed and poignant viewer position, and manages to introduce a clear focus into what could come across as a random assemblage of images by means of its framing and arrangement of scenes, its rhythmic editing, and its use of a reverberating light and color scheme. Working by way of oral and visual resonances and repercussions, the film provides an almost uncanny sense of closure; its powerful appeal lies precisely in the sense of reciprocity or resonance communicated on the level of images—pulling England closer to Syria, peace closer to war, and ultimately suggesting a world that operates by means of a global grid of structured actions and images (the media images on screen or in print that structure the action’s backdrop, the images of family bliss or suffering that make the narrative immediately understandable, the arrangements of shots that call upon each other and create a micro-level of familiarity within the video). The video thus attests to the transcultural efficiency of a media image archive charting what is presented as the “human condition.” But at the same time it gives evidence of the legacy of early film and its techniques of enlisting shortness for the purposes of contingency management and narrative condensation and deceleration. The digital shorts I selected are extremely diverse, but all three draw upon representational patterns and technical means that gesture back to the aesthetic of early film. Their narrative repertoire, of course, no longer feeds primarily from the archives of literature, but has become much more variegated: among other things, digital shorts draw on the rich tradition established by early film itself. Then as now, short films rely heavily on the effect of surprising twists and turns, resorting to technical tricks and transmedial signals to bring their stories across. But they do tell stories, and their storytelling is not only an ancillary endeavor, tacked onto the demonstration of medial possibilities: it constitutes what I think is their core. As different as these films are, they all engage in contingency management by exposing the malleability of time and space. The logics of contraction, condensation, and expansion play an enormously important role in this context. Narration in the digital short is put to use fashioning subject and viewing positions that do not work primarily by means of identification or sympathetic alignment but rather rely upon the connectives of recognition or resonance: presenting the familiar in a new guise, lending coherence to the discordant, and rearranging knowledge by disclosing repercussions and analogies. Now as at the beginnings of the filmic project, the short form may signal marginality—taking the guise of a footnote, an afterthought, an adaptation or variation—but it can just as well (and simultaneously) communicate a sense of closure: the last word on a subject, a final insight, a simple truth. Whether these developments are the last throes of a system that has run its course or whether they point to the beginning of a new era of audiovisual narration is still unclear. We shall see. Abel, Richard. The Ciné Goes to Town: French Cinema 1896-1914. Rev. edition. Berkeley: U of California P, 1994. Print. Anderson, Benedict. Imagined Communities. Reflections on the Origin and Spread of Nationalism. Rev. ed. London: Verso, 1991. Print. Buckland, Warren, ed. Puzzle Films: Complex Storytelling in Contemporary Cinema. Malden: Blackwell, 2009. Print. Bukatman, Scott. “Spectacle, Attractions and Visual Pleasure.” The Cinema of Attractions Reloaded: Film Culture in Transition. Ed. Wanda Strauven. Amsterdam: Amsterdam UP, 2006. 71-82. Print. Burch, Noël. Life to those Shadows. Berkeley: U of California P, 1990. Print. Dawson, Max. “Television’s Aesthetic of Efficiency: Convergence Television and the Digital Short.” Television as Digital Media. Eds. James Bennett and Niki Strange. Durham: Duke UP, 2011. 204-29. Print. Denson, Shane. 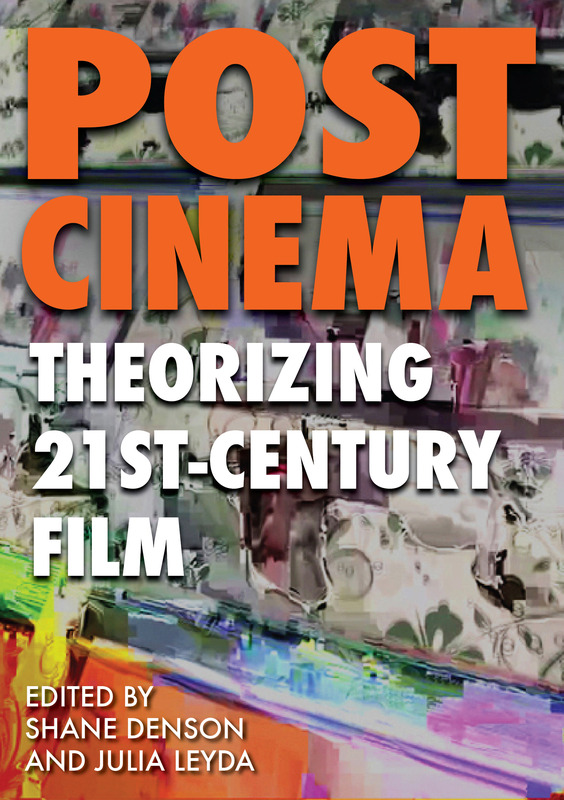 “Crazy Cameras, Discorrelated Images, and the Post-Perceptual Mediation of Post-Cinematic Affect.” In this volume. —. Postnaturalism: Frankenstein, Film, and the Anthropotechnical Interface. Bielefeld: Transcript, 2014. Print. Dillmann, Martin. Poetologien der Kontingenz: Zufälligkeit und Möglichkeit im Diskursgefüge der Moderne. Wien: Böhlau, 2011. Print. Doane, Mary Ann. The Emergence of Cinematic Time: Modernity, Contingency, the Archive. Cambridge: Harvard UP, 2002. Print. Elsaesser, Thomas. “Freud and the Technical Media: The Enduring Magic of the Wunderblock.” Media Archaeology: Approaches, Applications, and Implications. Eds. Erkki Huhtamo and Jussi Parikka. Berkeley: U of California P, 2011. 95-188. Print. —. “Tales of Epiphany and Entropy: Around the World in 80 Clicks.” The YouTube Reader. Eds. Pelle Snickars and Patrick Vonderau. Stockholm: National Library of Sweden, 2009. 166-186. Print. Esposito, Elena. “The Arts of Contingency.” Critical Inquiry 31.1 (2004): 7-25. Print. Ewalt, David M. “Aardman and Nokia Make Dot, The World’s Smallest Film.” Forbes (18 Oct. 2010). Web. <http://www.forbes.com/sites/davidewalt/2010/10/18/aardman-nokia-make-dot-the-worlds-smallest-film/#5341797dc197>. Ezra, Elizabeth. Georges Méliès. Manchester: Manchester UP, 2000. Print. Felski, Rita. Uses of Literature. Oxford: Blackwell, 2008. Print. Frazer, John. Artificially Arranged Scenes: The Films of Georges Méliès. Boston: G.K. Hall, 1979. Print. Gaudreault, André. From Plato to Lumière: Narration and Monstration in Literature and Cinema. Trans. Timothy Barnard. Toronto: U of Toronto P, 2009. Kindle. Glaubitz, Nicola, Henning Groscurth, Katja Hoffmann, Jörgen Schäfer, Jens Schröter, Gregor Schwering and Jochen Venus. Eine Theorie der Medienumbrüche 1900/2000. Siegen: Universi, 2011. Print. Gruber, Carola. Ereignisse in aller Kürze: Narratologische Untersuchungen zur Ereignishaftigkeit in Kürzestprosa von Thomas Bernhard, Ror Wolf und Helmut Heißenbüttel. Bielefeld: Transcript, 2014. Print. Gunning, Tom. “The Cinema of Attraction[s]”. Wide Angle 8.3-4 (1986): 63-70. Print. Hansen, Miriam. Babel and Babylon: Spectatorship in American Silent Film. Cambridge: Harvard UP, 1991. Print. —. “Early Cinema, Late Cinema: Permutations of the Public Sphere.” Screen 34.3 (1993): 197-210. Print. Holzinger, Markus. Kontingenz in der Gegenwartsgesellschaft: Dimensionen eines Leitbegriffs moderner Sozialtheorie. Bielefeld: Transcript, 2007. Print. Huhtamo, Erkki und Jussi Parikka. “An Archaelogy of Media Archaeology.” Huhtamo und Parikka, eds. 1-26. Print. Jenkins, Henry. “YouTube and the Vaudeville Aesthetics.” 2006. Confessions of an Aca-Fan: The Official Weblog of Henry Jenkins. Web. <http://henryjenkins.org/2006/11/youtube_and_the_vaudeville_aes.html>. —. Convergence Culture: Where Old and New Media Collide. New York: New York UP, 2006. Print. Klinger, Barbara. Beyond the Multiplex: Cinema, New Technologies, and the Home. Berkeley: U of California P, 2006. Print. Lorenzo, Caridad Botella. “The Mobile Aesthetics of Cell Phone Made Films: A Short History.” Cinema Scope: Independent Film Journal 17 (2012). Web. Luhmann, Niklas. Soziale Systeme: Grundriß einer allgemeinen Theorie. Frankfurt/M. : Suhrkamp, 1993. Print. Makropoulos, Michael. Theorie der Massenkultur. München: Fink, 2008. Print. Manovich, Lev. The Language of New Media. Cambridge, MA: MIT Press, 2001. Print. Mittell, Jason. Complex TV: The Poetics of Contemporary Television Storytelling. New York: New York UP, 2014. 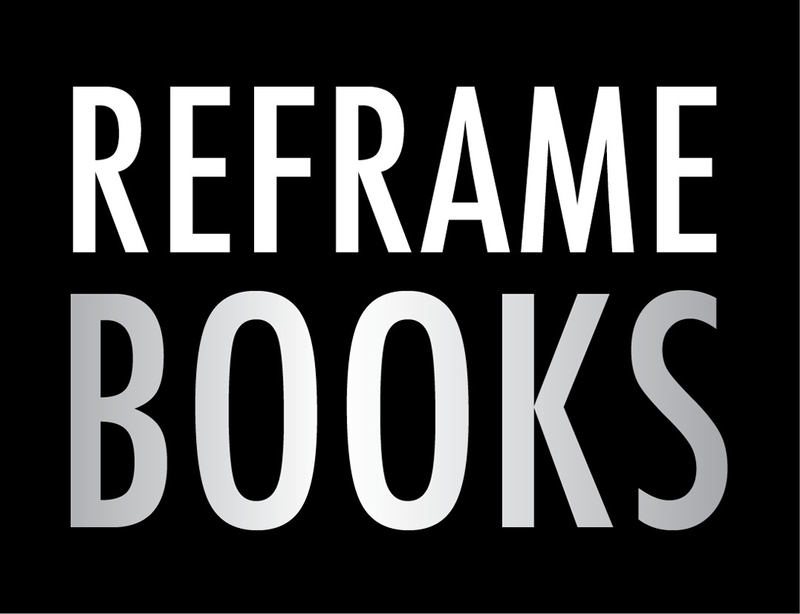 Web, <http://mediacommons.futureofthebook.org/mcpress/complextelevision>. Moen, Kristian. Film and Fairy Tales: The Birth of Modern Fantasy. London: I.B. Tauris, 2013. Print. Musser, Charles. The Emergence of Cinema: The American Screen to 1907. New York: Scribner’s, 1990. Print. —. “A Cornucopia of Images: Comparison and Judgment across Theater, Film, and the Visual Arts during the Late Nineteenth Century.” Moving Pictures: American Art and Early Film, 1890-1910. Eds. Nancy Mowll Mathews. Manchester, Vt: Hudson Hills P, 2005. 5-38. Print. —. “Rethinking Early Cinema: Cinema of Attractions and Narrativity.” Strauven, ed. 389-416. Print. Pauleit, Winfried, ed. Die Kleine Form. No. 11 von Nach dem Film. 2010. Web. <http://www.nachdemfilm.de/content/no-11-die-kleine-form>. Rizzo, Teresa. “YouTube: The New Cinema of Attractions.” Scan 5.1. (2008). Web. <http://scan.net.au/scan/journal/display.php?journal_id=109>. Rosa, Hartmut. Beschleunigung: Die Veränderung der Zeitstrukturen in der Moderne. Frankfurt/Main: Suhrkamp, 2010. Print. —. Beschleunigung und Entfremdung: Entwurf einer kritischen Theorie spätmoderner Zeitlichkeit. Frankfurt/Main: Suhrkamp, 2013. Print. Shaviro, Steven. Post-Cinematic Affect. Winchester: Zero, 2010. Print. Sobchack, Vivian. “Afterword: Media Archaeology and Re-presenting the Past.” Huhtamo and Parikka 323-33. Print. Staiger, Janet. Interpreting Films: Studies in the Historical Reception of American Cinema. Princeton: Princeton UP, 1992. Print. Stork, Matthias. “Video Essay: Chaos Cinema: The Decline and Fall of Action Filmmaking.” IndieWire’s Press Play. 24 Aug. 2011. Web. <http://blogs.indiewire.com/pressplay/video_essay_matthias_stork_calls_out_the_chaos_cinema>. Strauven, Wanda. “Introduction to an Attractive Concept.” Strauven, ed. 11-28. Print. Verstraten, Peter. “Between Attraction and Narration: Early Film Adaptations of Fairy Tales.” Relief 4.2 (2010): 237-51. Web. <https://www.revue-relief.org/articles/abstract/10.18352/relief.547/>. Zipes, Jack. The Enchanted Screen: The Unknown History of Fairy Tale Film. New York: Routledge, 2011. Print.